It's Friday, I'm back in the US, and I've actually had time to make something! 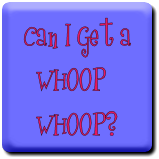 It's time for us to get our whoop whoop on - I hope you're ready too! in a hoop that she had made for Emmy, and asked me to make it into a pillow for her room. and while I was in China, I came up with a great idea. When I saw the color of the stitching on my daughter's piece, I realized that it was the same as the blue green in the Etched line, so I dragged out my scraps from the quilt. I had more than enough of several of the blue green prints to cut the necessary squares, and added in a few of the coral squares just to break up the design. You may remember this blog post where I discussed making blocks using fusible web and a grid to put the pieces together quickly. I decided that would be the most efficient way to make this pillow top, so I grabbed my lightweight fusible webbing, laid it on my gridded cutting board, and started laying out pieces. Note - you need a piece larger than your finished pillow top - something I forgot the first time I cut it out! And on another note, in my experience, this technique gives you perfectly matched seams every time - so much easier than traditional piecing! You can read more about the process of sewing the patchwork on the earlier blogpost (referenced above) but when I finished sewing all the seams, I put a piece of backing material (muslin) on the top, drew a circle in the center the size of the opening I needed, and sewed around it. Cut out the center, turned the muslin to the back, and pressed it well. I made a quilt sandwich of more muslin and batting, and centered the needlework under the circle. Basting spray holds all the layers together. On my Singer, I used a blanket stitch to secure the edge of the circle through all the layers. Then I switched over to the Juki and did some cross-hatch straight line quilting. I really like all the texture the cross-hatch quilting gives it, and I think Emmy will love it, don't you? This joint venture with my daughter, up-cycling a wall hanging into a different purpose, has been a lot of fun! What's making you whoop it up? What's got you dancing the happy dance this week? Adorable pillow. I am sure she is going to love it. You get a BIG whoop whoop! It's adorable! That pillow is so incredibly cute!!! Wow, what a great method of making the pillow and incorporating the embroidered piece! Also, it never occurred to me that I could used my cutting board to show through some taped-down fusible web for a guide to lay down squares for my landscape backgrounds--no grid drawing, yay! Can't wait to try it. Your pillow turned out gorgeous and is perfect with the quilt for sure. The pillow is great. Thanks for showing us how you made it. This is beautiful! Love those colours and fabrics. I just love what you did with the hoop embroidery, and that it's a joint mother/daughter project for Emmy. Such pretty colours. A special project indeed. What a beauty! Love it. Welcome back for China! I always forget about that fusible method. It really is simple. Nice pillow. I've been cleaning and servicing machines, not stitching. I would be absolutely comatose after such a trip, and unable to make such a lovely pillow! Welcome home! That was a great idea and I like the way it turned out. Love the pillow, Sarah! Perfect way to showcase the stitchery and use those beautiful scraps! Whoop whoop! Well done Sarah! I'm sure she loves it. =) I've done this type of fusible piecing making the Mondo bag. It was very efficient. Did you use a pillow form to fill the pillow of just polyfil?